It’s very beautiful and private. The location is great as well! Near to the beach! Cute bungalow right near the best beach in Canggu in a good location between shops and beach. Check out the restaurant as well - doesn’t overwhelm you looking at the menu but it’s really great! Stunning wood carving in the ceilings. The overall environment of the property and specially our villa was excellent. The bedding was very good, slept extremely well. AND the staff and service - World Class. Beautiful, huge room with large bed, living area, desk, seating, art, etc. Beautiful outdoor patio space overlooking the lovely pool and grounds. The location is excellent--just a short walk to the beach, Finn's Beach Club, etc. We really enjoyed our stay and would have liked to have more than one night here. Good value for the money. We had beautiful time at Villa Berawa. Everything was perfect. Located just 6-7mins walk from the beach. Also very close (walking distance) to CrossFit gym which we attended almost everyday for training. Villa is really large and better as on the pictures. We have had enough privacy there and lot of comfort for us and also for our 3 years old son. The stuff here is really amazing. They do everything for you to feel like home. With beautiful Balinese smile :) Thank you guys for amazing stay we had and still have here. (We extended our stay by 2 additional nights here) Oh - and the pool...GORGEOUS!!! :) you can also order massage directly to your villa. You just ask the reception and they will arrange it within 30mins. Really comfortable when you are working out at gym daily like us. 60mins massage cost between 9-11€. Outstanding little find, fantastic pool and the poolside rooms are like mini apartments! The environment, the staff and the management. Everyone was very friendly, timely and always accommodating. Stunning pools and restaurant. Very helpful and friendly staff. Beautiful, private Villa in a quiet area. Easy walk to the Beach Club and had everything we needed. Everything! Amazing caring staff. Beautiful villa. 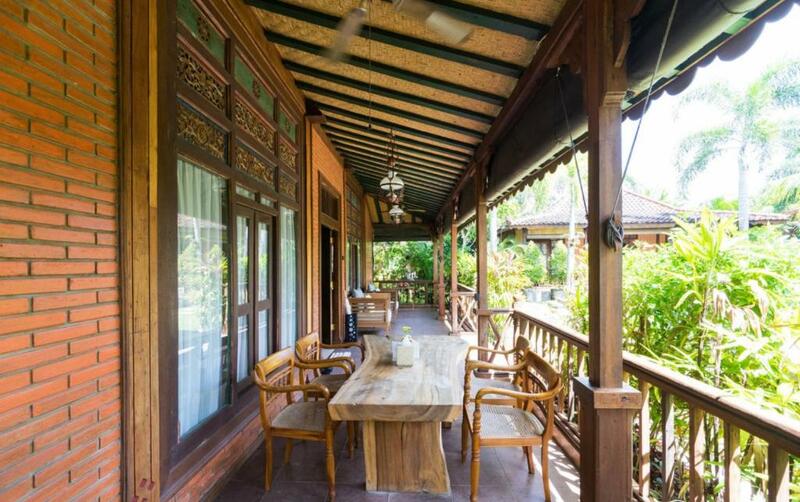 Lock in a great price for Villa Berawa – rated 8.8 by recent guests! 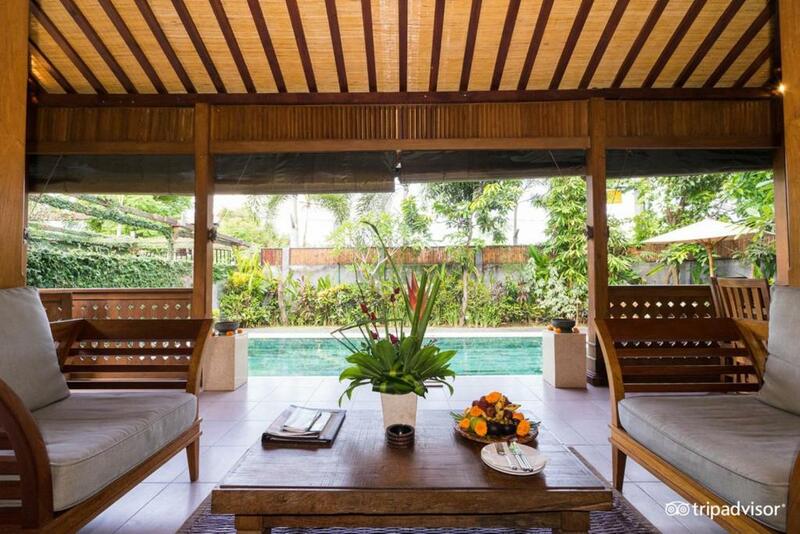 Villa Berawa This rating is a reflection of how the property compares to the industry standard when it comes to price, facilities and services available. It's based on a self-evaluation by the property. Use this rating to help choose your stay! One of our top picks in Canggu.A 10-minute stroll from Berawa Beach and Finns Beach Club, Villa Berawa houses air-conditioned accommodations under coconut trees. It features a restaurant and an outdoor pool surrounded by tropical gardens. Daily one-time drop off shuttle service to Seminyak area is provided. All rooms come with a 4-poster bed and each unit features a flat-screen cable TV, mini-bar and a seating area. Pool views can be enjoyed from the private terrace. Select villas include a private outdoor pool. 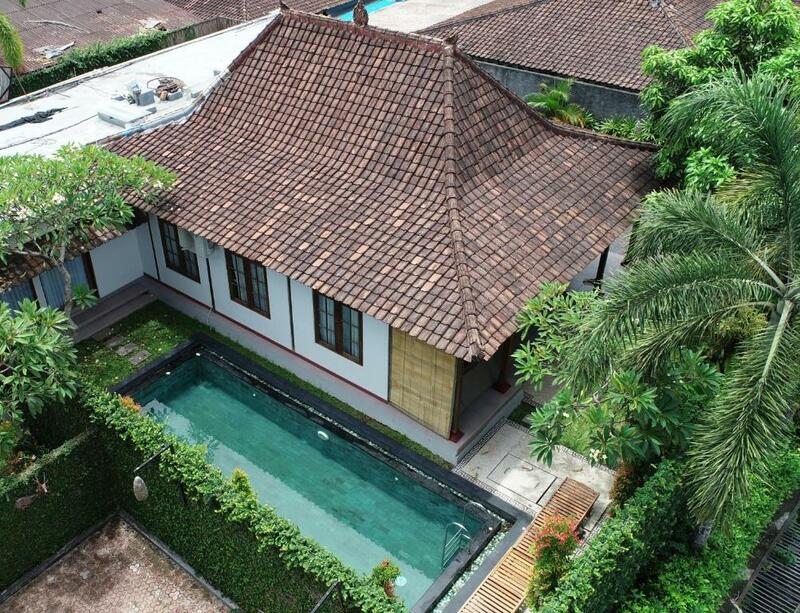 Villa Berawa is located a 10-minute drive from Echo Beach and Seminyak area. Guests can view sunsets in Tanah Lot, located a 30-minute drive from the property. Ngurah Rai International Airport is 60 minutes’ drive away. The property provides currency exchange and babysitting/child services. Massage services and free bicycle rentals are also offered. A tour desk, car rental and ticket services are available for guests who wish to explore the area. Free WiFi is accessible throughout the property. Guests can enjoy Indonesian cuisine in Dapur Berawa Restaurant, which also offers room service. Daily breakfast and afternoon tea are also served in the restaurant. Breakfast in room can be arranged upon request. When would you like to stay at Villa Berawa? Featuring a private terrace overlooking the pool, this air-conditioned studio includes an electric kettle, refrigerator and a mini-bar. A DVD player, CD player and a flat-screen cable TV are also provided. Private bathroom offers shower facilities and free toiletries. Featuring direct access to the pool, this air-conditioned Joglo offers a larger living area. A DVD player, CD player and a flat-screen cable TV are provided. Private bathroom offers shower and bath tub facilities and free toiletries. Featuring a private terrace overlooking the pool, this air-conditioned villa comes with a private pool. It provides a flat-screen cable TV, CD player and a DVD player. The private bathroom in the main bedroom has a bathtub while the extra bathroom has shower facilities. The villa is located in the front area of the complex, near the restaurant and close to the street. Suitable for up to 6 guests, this 3-bedroom villa features an outdoor living and dining area and a private pool with sun beds. Each air-conditioned room has a flat-screen TV and a 4-poster bed with mosquito nets. We are offering many activities for family and children which are some within walking distance from our villa. Such as surfing, horse riding, water park, cycling, excursions, scooter rental and many more. Our reception is more than happy to arrange. House Rules Villa Berawa takes special requests – add in the next step! Villa Berawa accepts these cards and reserves the right to temporarily hold an amount prior to arrival. Please inform Villa Berawa of your expected arrival time in advance. You can use the Special Requests box when booking, or contact the property directly using the contact details in your confirmation. If somebody is complaining about something in this Villa than I thing he’s simply unsatisfied person on this planet :) Maybe just some advise for other travellers. Air conditioning is a bit noisy (but it has to be if you want cool temperatures inside). So bring some earplugs with you. Or you can switch it off. The time for the massage is wrong. The menu is 1 hour, however we only have 30 min massage. We complain with the staff, and they even don’t know the right time for the massage! They only said that they will confirm with massage company. Just 10 min walk to the ocean club. I don’t have anything bad to say about it. Pool could be slightly cleaner. The shower area and toilet looked old and outdated. The property and all staff members, especially Widya and Angga, were so helpful in all the ways. They made our stay just wonderful. Thank you so so much! More flexibility with free inclusive breakfast and afternoon tea would have been appreciated but still very good. The staff were exception, attentive, friendly and fantastic butler service straight to our room. 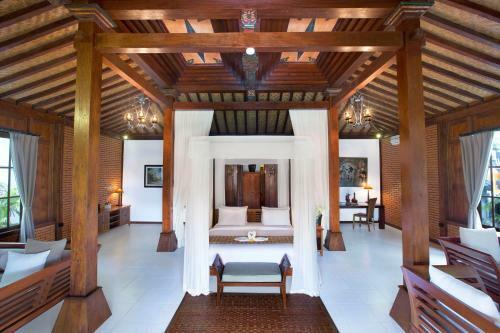 It was very easy to organise transfers, a day trip to Ubud, and massage in our room via reception. We also took advantage of the free transfers to the Canggu area to explore. The location is ideal, close enough to the shops and bars near Berawa beach (5-10mins walk) but far enough away for peace and quiet. We also had the pool to ourselves most of the time. From the moment you're welcomed with a drink and cool face cloth. Throughout your stay that staff will try to make your time super relaxing, they really focus on every detail e.g. international plug adapters - why doesn't everyone do that! There are four bungalows arranged around a swimming pool, each bungalow is huge, and has it's own porch with a few plants in front so that you have some privacy too. (FYI there are also some private Bungalows with their own pool). Breakfast is served to your bungalow, you have couple of armchairs and a table and chairs on the porch. The air-conditioning is really good, and WiFi is probably best I've had so far Bali - it tends to be pretty bad here. Location wise, it's waking distance to the beach and some really good cafes. The included breakfast was very limited and other food that was ordered for room service from the restaurant was not great. Rooms were a bit run down, some tiles coming away from floor and power points damaged but this does not affect stay. Massive pool - great for families and large groups of friends. Staff were attentive and helpful. Aircons in all rooms and room made up each day. Quiet and good area, close to shops and restaurants. Also rear access with parking for scooters made coming and going really easy. 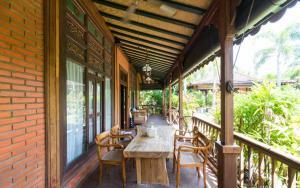 Villa Berawa was a wonderful, authentic family holiday stay that we really enjoyed. What we liked were the attentive , very friendly, helpful staff and the location was fantastic. Special thanks to Widya, Anguu and the team, they were so helpful and lovely. Nothing was too hard for the team who always had a smile for us very moment of our stay and made our 3.5 year old daughter feel so welcome. Great family Villa and the 3 bedroom we stayed in had all the facilities we needed, Large, great air-con, massive pool and a great size for easily two families. Bathroom was lovely with large granite bathtub. They had a shuttle ready to take us to the great local restaurants and Finns Beach Club was excellent. A comfortable intimate Villa Resort, walking distance to beach and restaurants with a true authentic Balinese atmosphere and design. It was low key, friendly and a great location, we would definitely stay again. Thank Villa Berawa!! A very destroyed villa. Damaged boards by the pool with protruding nails! Moisture on the walls. Dirty things, torn pieces of furniture. Villa off the beaten path from 2 sides street. Cables with electricity above the pool! 2 bedrooms, but open kitchens away from each other, so fear to leave the children alone in the bedroom. No drum dryer despite the description of the villa. Dirty towels. Breakfast very good, you can order to the villa.Nicely arranged rooms. Very, very nice service. Is the whole value of this place.